A new survey of attendees at Apple's annual Worldwide Developers Conference found that nearly half of iOS developers attending the conference support Android, while just 7 percent write applications for the Mac. 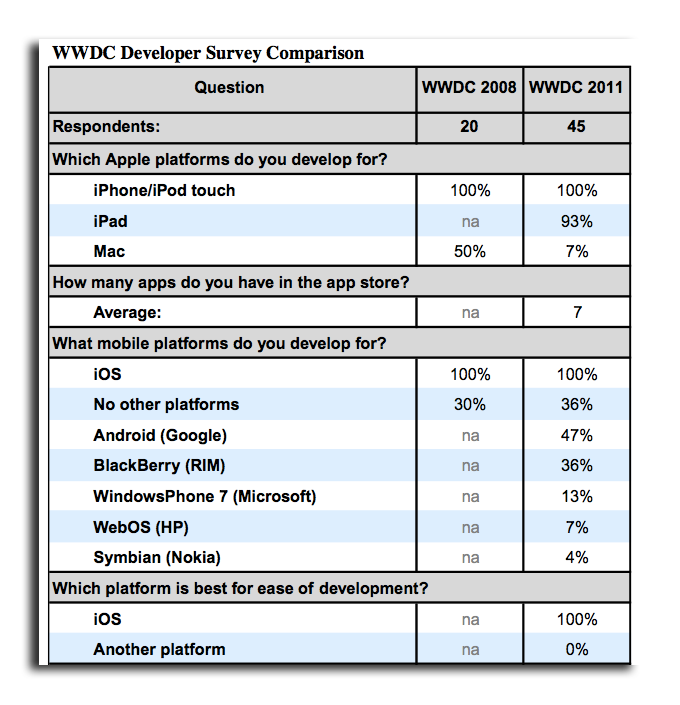 The details come from Piper Jaffray's WWDC Developer Survey Summary, released Monday. Analyst Gene Munster and his team polled 45 developers at the Apple conference, where naturally they would support Apple platforms. The survey did find that 22 of those 47 developers also write applications for Android. But all of those 22 developers said they prefer iOS monetization and ease of development over Google's Android platform. Last year, shipments of devices running the Android mobile operating system surpassed Apple and the iPhone. While Android has seen tremendous growth, iOS users have repeatedly been found to be more likely to purchase paid applications. Android developers have expressed concern over fragmentation on the platform, and even Google has said it is "not happy" with slow application sales. 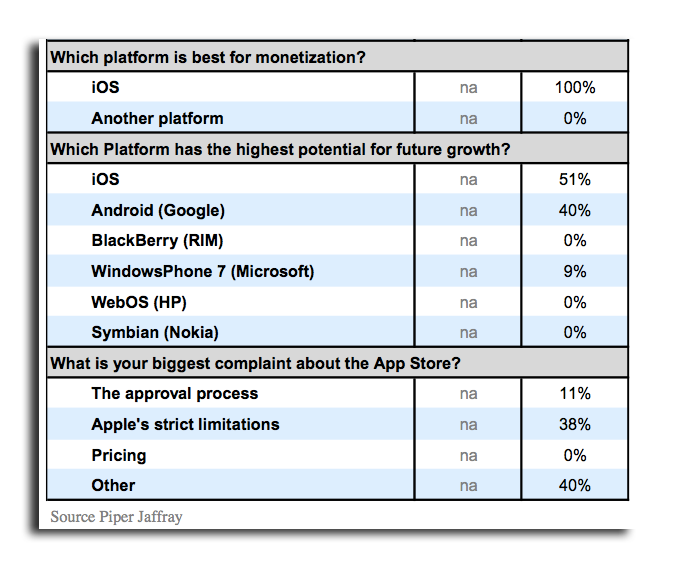 Android wasn't the only popular platform among those surveyed at WWDC. Among respondents, 36 percent indicated they create applications for BlackBerry, while 13 percent support Windows Phone 7. A total of 36 percent of respondents develop solely for Apple's iOS. That's up from the 30 percent who said they only supported Apple in a similar survey in 2008. Among the 45 developers polled, 51 percent said they believe iOS has the highest potential for future growth, while 40 percent said growth would come from Android. But among the 22 developers who also write for Android, two-thirds of those said Android has the highest potential for growth. On average, developers surveyed by Piper Jaffray have 7 applications in the App Store. And 93 percent of those who write for the iPhone and iPod touch also support the iPad. But just 7 percent of those polled at WWDC also write applications for the Mac. That's a major change from 4 years ago, when native applications didn't even exist on the iPhone platform, and WWDC was a show represented by 100 percent Mac developers. Piper Jaffray has maintained its "overweight" rating for AAPL stock with a price target of $554. Munster believes the survey shows Apple's devoted core of developers is an important component for future success. "We believe our survey shows that Apple's strong developer base is one of its greatest assets in mobile and differentiates iOS from the early days of the Mac, suggesting iOS is better positioned than Mac OS to maintain and grow market share," he said.